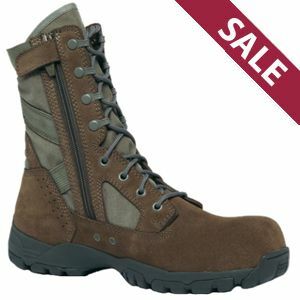 The Tactical Research TR696Z CT FLYWEIGHT USAF Composite Toe Zipper Boot is designed for Air Force troops looking for a lightweight, light-duty, tactical-style boot with toe protection. It is constructed of 100% suede leather and abrasion resistant nylon Cordura for both durability and maximum breatheability in hot weather. A side zipper is ideal for troops looking for speedy wear and removal. Side air vents provide additional air ventilation to ensure your feet stay dry and cool at all times. It's running shoe design provides excellent comfort and fit especially after long duty shifts. The TR696Z CT also features a Tactical Research TR-1 insole for maximum shock absorption. This boot is approved for wear with the Air Force Airman Battle Uniform (ABU) and meets U.S. Air Force uniform regulations.